Our journey began in 2012 with a determination to make music accessible to everyone, regardless of age or ability. We wanted to create wellbeing. We wanted to combat loneliness and isolation. We wanted to give opportunities to those experiencing financial hardship. We are proud of what we have achieved over the past six-and-a-half years. We have delivered music lessons and workshops to people facing economic hardship, people with enduring mental health conditions, adults with learning differences, young people with autism. We would like to thank all those who have collaborated with us, those who have provided tuition, our volunteers, and those who have funded our endeavours… You have all been amazing! Our next Workshop is happening this coming Saturday at The Racecourse Pavillion in Northampton. Aimed specifically at young people with autism this two hour workshop will comprise of exploring instruments and sound, learning songs, singing and elements of dance. 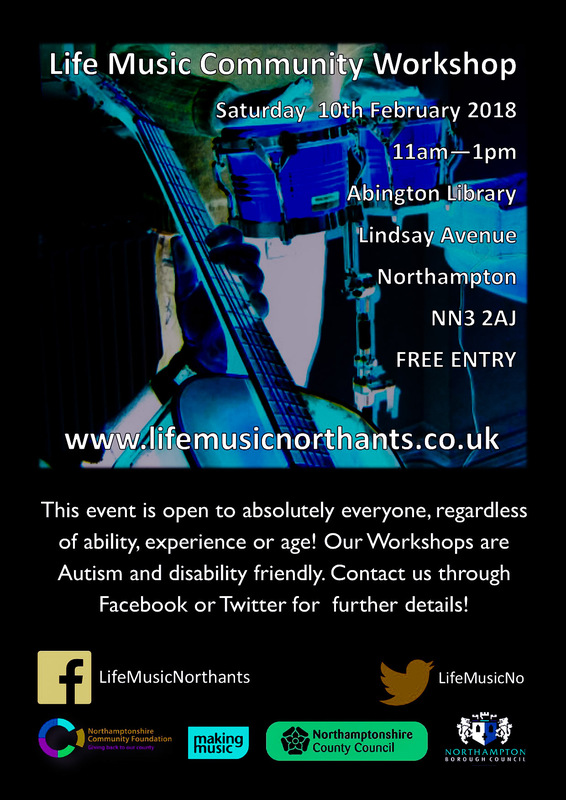 Email nicolas@lifemusicnorthants.co.uk for further details and to book a place. We have received some lovely feedback from families who attended our Music Workshop yesterday! Thank you to all those who attended our Workshop at The Umbrella Fair Pavilion yesterday, and what an amazing Workshop it was! Percussion exercises, voice & vocals, and three songs – Scarborough Fair, Angels and We Are The Champions learnt and performed. Our participants, all from The Daisy Chain Club – a local organisation supporting families with children with additional needs – were all amazing, so much drive and energy! We look forward to working with them soon! We hope everyone enjoyed this workshop at The Umbrella Fair Cafe as much as we did! Lovely to see people who have been to previous workshops, and lovely to meet some new participants.